HALLU recently debuted at Walmart four new fantastical and whimsical collections. The collections capture the spirit of Unicorn, Mermaid, Fairy and Gnome — each with their own unique fragrance and personality. Each collection features five must-have pieces including large, floating bath bombs ($3.97), body scrubs, scrub & body butter bars, body mists and unique body lotions ($4.97 each). 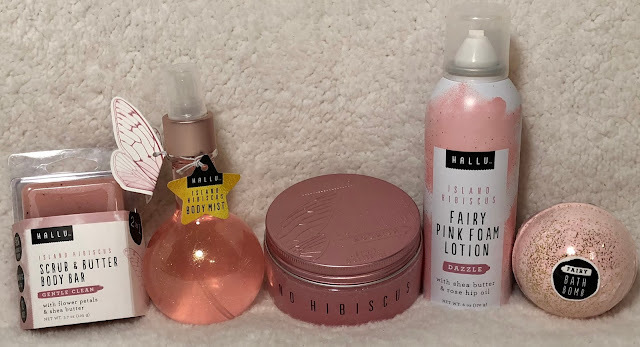 We received the HALLU fairy line and I have to say I really like it. It has a sweet floral smell that lasts. I'm one of those that likes to layer with the same scent so that it stays on longer than my time in the bathroom so I was really happy to see so many products in the same scent. I gave a set of these to my teenage niece for Easter and she was over the moon with excitement. She immediately asked me where she could get more! Feel happily ever after with the Vitamin-E infused HALLU Fairy bath and body collection. The Island Hibiscus fragrance is infused with a floral scent that mingles in a garden of hibiscus, water lily, jasmine and rose rounded out with notes of sheer vanilla, musk and shaved wood. Fairies are good at taking care of others, but with HALLU, it’s your turn to be spa-taneous and treat yourself. The Fairy Bath Bomb sparkles with a rose gold mica and a swirling combination of millennial pinks and whites. Add even more twinkle with the Shimmering Rose Gold Body Scrub that gently exfoliates while providing intense hydration and moisture with shea butter, coconut oil, sunflower seed oil and Vitamin E. The 2-in-1 Scrub & Body Butter Bar hydrates while exfoliating dry skin with coconut oil, shea butter, cocoa butter, hibiscus petals and sea salt. Finish with the Fairy Pink Foam Lotion and Body Mist. The unique, lightweight foam body lotion is made with vitamin-rich rose hip oil and moisturizing shea butter, spreading evenly for maximum moisture. Rose gold mica adds a kiss of shimmer for radiant and healthy-looking skin. Polish off the ethereal effect with the millennial pink Island Hibiscus-scented body spray containing floating rose gold mica that comes packaged in a delicate, spherical bottle. Buy it: You can find these and the rest of the HALLU line in store and online at Walmart.com . I will have to check this out, my teen daughter also likes to different items of the same scent and this might be something she would enjoy.